Oh brother-the second to the last person Edison wants to see. Well, this should be interesting. And here you thought she was just gonna smoothly sail into her reunion with Dilbert. Ah well, we’ll just have to see what happens. Coming up on Monday, an awkward silence, and a mutual agreement. And another cameo or two! Looks like all the cool comic characters take the airship to Littlecrow! UPDATE: Run, don’t walk (or click, or whatever) the link to October 20th on your right. The Groovy, Kinda musical is in full swing! Nice to have you back in the saddle, Charlie. Thank you! It’s good bo be “back.” I say “back,” because I still live in fear that this will all go away again. So, let’s just enjoy it while we can. I’m thankful for every panel I can pencil. And I’m most thankful for you and your kind words. But the BIG NEWS here is that Vas is back! Yay! Go check out Rasputin Barxotka for a new storyline. It promises to be great stuff. hello, after seeing the first panel for some reason, I feel like having some Mushroom Chicken for supper tonight. Don’t know why???? Edison cannot stop drinking can she. Unless, it is a regular lced Tea. Old neighbors, what to do. Be nice and push them out the window. That will get rid of any bad memories. Old neighbor and former best friend. I had a feeling that you’d like today’s strip, mj. 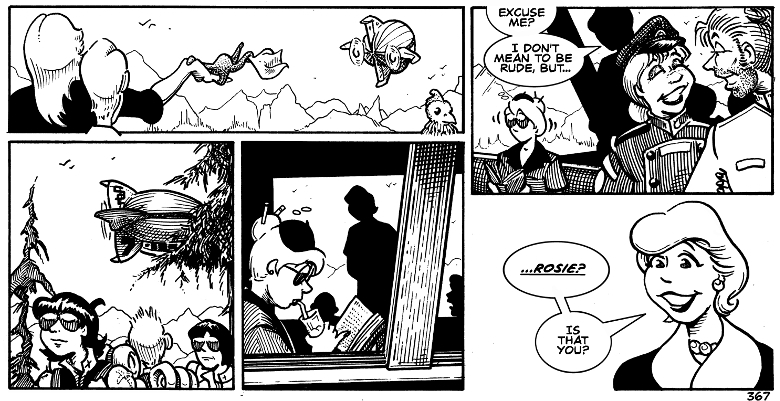 In case you’re wondering, the three kids in panel 2 are the Vatican Assassins, stars of one of my favorite webcomics. Looks like they’re on their way to do a hit at the remote mountaintop Monastery of Saint Spreservus. I love it! You’re the best! Your cameos are excellent as always, Charlie. I spy a Rai and the assassins three! Of course, Rai is an employee of Hindenburger, so that should be expected, but I gotta say, this is the first time I’ve seen a cameo with actual continuity. I love the little hankie Robie’s waving. It’s really hard to tell who’s cuter, him or Stephanie. They’re just so precious! Thank you. It looks like Rai either quit or was fired from Hindenburgers. But that man was born to work in airships. And I agree, it’s hard to decide who is more adorable, Stpehanie or Robespierre. I think the round goes to the li’l hexapod this time. I almost missed the Vatican Assassins down there! The dark glasses disquised them well. Oh my. I love it, Charlie. Cat got a job there too! This is how I’d love to see them if they ever shake their curse. Operating a commercial blimp together. Thanks so much. But I thought…wait, isn’t, I mean, isn’t that how you said October 20th ended but I wasn’t supposed to tell anyone? Uh-oh. I think I goofed up. Oh well, I love the idea of Catherine as an airship pilot and Rai as a dishwa-I mean, matre d’ballon dirigeable.